Pupusas is a thick handmade filled corn tortilla, traditional to El Salvador served with tomato sauce and a special cabbage relish used in Central American cuisine. To prepare the corn dough: in a bowl place the corn flour and keep adding water and knead until the dough becomes soft. 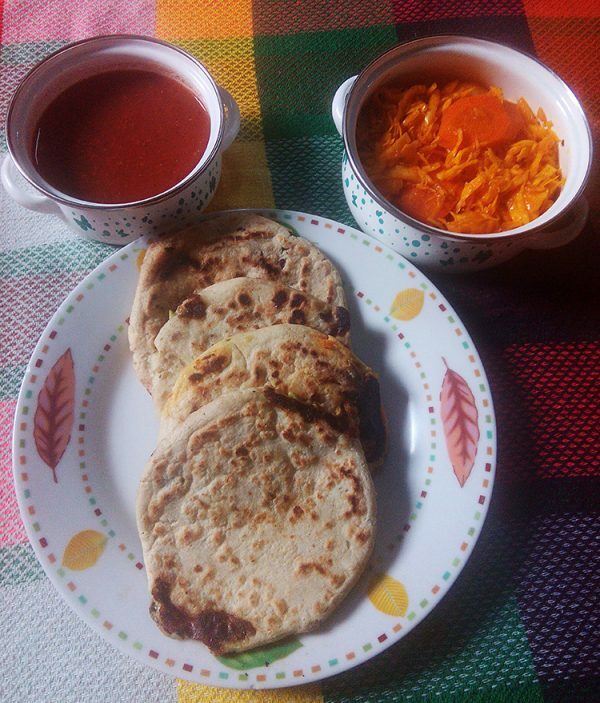 To prepare the Pupusas filling: mix all the refried red beans, vegetables and herbs with the cheese and keep aside. Different combinations of fillings that you prefer can be made. To prepare “curtido” (lightly fermented cabbage relish): mix the chopped cabbage, sliced onion, vinegar and part of the oregano, season with salt and pepper then put it in a container for at least for 4 hours before you are going to eat it. To prepare the sauce: in a cooking pot put the tomatoes with water and season with salt, pepper and oregano. When the tomatoes are cooked, liquefy in a blender and put it back into the pot until the sauce is boiled. To prepare the pupusas: take a portion of the corn dough and fill it with any combination of flavour filling you choose. Close up the edges of the small round tortilla and pat it into a flat thick tortilla. Place it into a frying pan and cook on both sides for a few minutes. Serve with the tomato sauce and curtido (cabbage relish).